Despite the fact that you’re well past your teenage acne years, sometimes breakouts happen and they’re no easier to deal with now than they were in your adolescent years. They add time to your morning routine, self-consciousness where it wasn’t before and just tend to make you feel a little less fresh overall. The worst part? It can happen to pretty much anyone for a number of reasons. Here’s how to identify why you’re breaking out and how to deal with it. Mineral oil, algea extract, cocoa butter and almond oil are among some of the pore-clogging ingredients that make their way into skincare products. While these ingredients can add much-needed moisture to those who need it, using them daily can create too produce too much oil if they’re not right for your skin type. The key to being effective with moisturizers is to choose one that is skin type specific for you. Touching your face or resting your cheek or chin on your hand while you’re sitting at a desk can put the germs and bacteria you touch all day (think: keyboards, phones, other hands, door knobs, bus poles) directly onto your face. 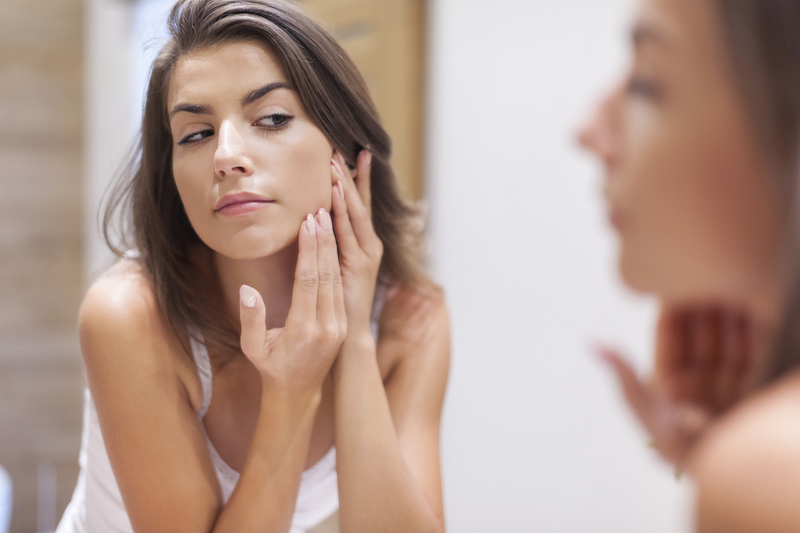 This is one surefire way to add more bacteria to your pores and create breakouts. The fix? Keep your hands occupied. Knit while you Netflix or get a toy for your desk to minimize unconscious face-touching to support yourself in the name of clear skin. You wash your face everyday, but how often do you cleanse your makeup brushes? It’s a good idea to wash them at least once a week to keep the transfer of last week’s oil and dirt at bay–and keep your makeup looking fresh. If you rely on a headband to keep your hair off your face when you workout, it could be to blame for your breakouts. Dermatologists call this kind of breakout “acne mechanica,” which is common among athletes, and triggered by pressure or irritation on the skin. Your gym items get riddled with sweat and nasty bacteria, so using them regularly without washing between use isn’t doing your face any favours. Skip washing your face or body after you workout and you risk of allowing the melty makeup, dirt and bacteria on your skin to mix with your sweat and stick in your pores. If you squeeze in workouts during an already tight-lunch break, stock your gym bag with an au natural cleansing cloth and make a point to clear the dirt off post-workout. If you’re no stranger to the odd bender, you’re probably guilty of falling asleep with your makeup on. This habit won’t just lead to accumulated bacteria in your pores, but also bloodshot eyes, paler skin, dark under-eye circles and even more visible fine lines. Be warned: foundations and oil-based primers are the worst offenders here, since they prevent a large surface area of the skin from breathing at night. If you always wear it when you go out, stock your bedside table with a super-powered cleansing wipe like this one. Stress causes the body to produce cortisol, the “stress hormone” which tells your glands to produce more oil. Oily skin can then become more prone to acne. Notice a stress spiral before it starts, and give yourself a break. Here are 6 quick fixes for dealing with it.